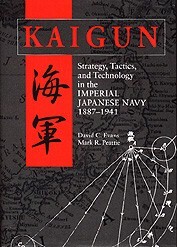 "Kaigun: Strategy, Tactics, and Technology in the Imperial Japanese Navy, 1887-1941"
Published by United States Naval Inst. To kick off my new series of book reviews, it seemed appropriate to crow a little bit. And what better way to do that than to review a book that I helped (in a very minor way) to create? David Evans and Mark Peattie's new "Kaigun: Strategy, Tactics, and Technology in the Imperial Japanese Navy, 1887-1941" represents the most comprehensive effort to date to describe the doctrinal changes the IJN went through from its inception to its ruin. The work traces the evolution of Japanese naval thought through three major wars, and clearly describes how the lessons that Japan learned in the Sino-Japanese and Russo-Japanese wars were carried through to the formulation of naval doctrine for the Pacific War. This ultimately worked very much to Japan's disadvantage, since these earlier victories ultimately led her to completely mis-analyze the fundamentally different character and military strength of the United States. Indeed, at the very time that Japan needed to be thinking most creatively about how to fight her more powerful future opponent, her past victories had already laid the foundation for a doctrine which was both rigid and fundamentally flawed. Nevertheless, the Japanese Navy did produce a number of impressive achievements, both tactically and in terms of technology. The IJN's development of masterful torpedo tactics, the Long Lance torpedo, the formulation of their very powerful carrier aviation arm, and the development of the Yamato-class super battleships were all manifestations of Japan's need to combat a U.S. Navy which was certain to be more numerous, and backed by a larger industrial base than the Japanese could muster. This, in turn, led to a naval doctrine which emphasized quality over quantity, offensive power over defensive capabilities, and front-line combat strength over logistical soundness. The origins of all of these tenets, and their extensions into Japan's tactics and shipbuilding programs, are all clearly explained in Kaigun. One thing that readers won't find much of is coverage of Japanese wartime tactics. As the authors state, "...because the fortunes of the Japanese Navy turned so disastrously by the end of 1943 and, because it was thereafter forced to desperate improvisations to maintain the struggle against the Allies, few strategies, tactics, and technologies devised in the interwar years had any relevance in the last year and a half of the war.... In any event, comments on specific aspects of Japanese naval strategy, tactics, and technology relating to World War II run throughout the later chapters of [the] work." The other major gap in "Kaigun" is that it contains only the most superficial coverage of the development of Japanese air doctrine and tactics. This omission was deliberate, in that the Naval Institute Press decided that the book was already too long and requested the authors to remove these chapters. The authors plan to release this material in a second volume, the manuscript for which is tentatively slated for completion in fall of 1998. In sum, this work is clearly an important contribution to the Western literature on the topic area. For anyone interested in the Imperial Navy, or the development of naval doctrine in general, it is an essential part of their library.